The first time I traveled from Delhi to Gulmarg was in the month of August; and the scenery was lush green all around. As I was busy walking through the Gulmarg golf course clicking pictures, the only thought running through my head was how it would all look in white, buried under several feet of snow. I am not saying that Green was all bad; it was better in fact. But after witnessing the beauty of Gulmarg right after monsoon, when the entire valley was at full blossom; I so badly wanted to see it covered in white as well. Gulmarg is a place that is bound to have its effect on you. It will make you want to visit here again and the same thing was happening with me. I was in Gulmarg and was already planning my next visit there; and this time, in winter season. So did I go back in winter? Yes. Was Gulmarg any different? It was a lot different. 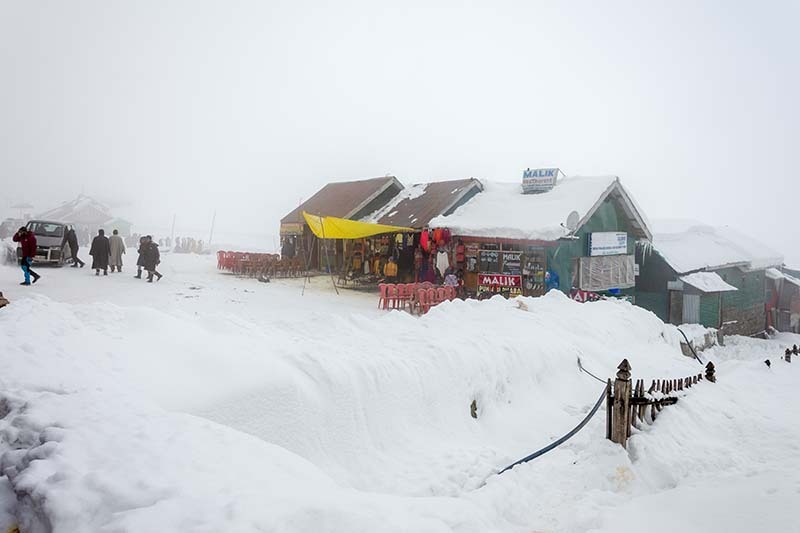 Gulmarg in winter is a different story entirely than Gulmarg during rest of the year. It really turns into a completely different place. 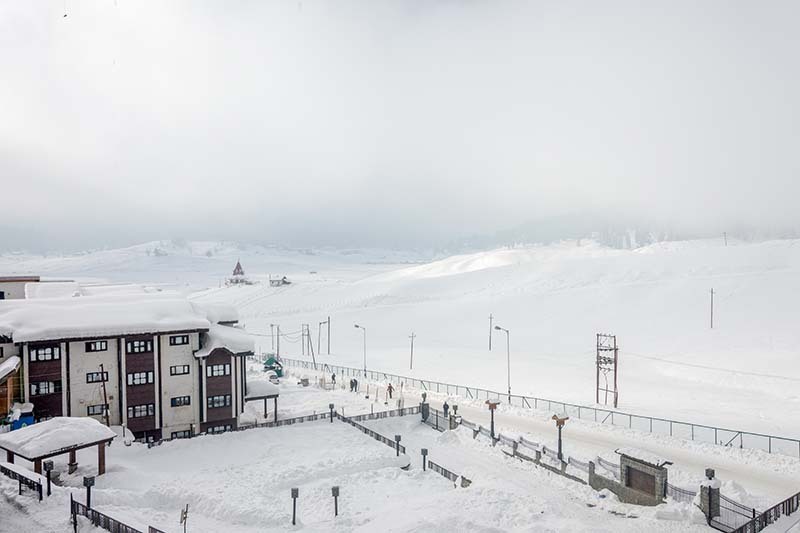 A carpet of white covers the entire region and that huge golf course turns into a ski ground. One thing that remains the same still however is the beauty of the place. Only the color turns from green to white but the magic will be the same. The plan for this trip was in fact set in motion several months in advance; the only detail remaining to be finalized were the dates. At first, the idea was to plan the trip towards mid-February because that is when the snow on ground is at its highest. A cousin of mine however kind of blackmailed me emotionally into changing my plans. He had never seen a live snowfall and wanted to experience it badly. The only catch was that he could afford to be away from work only in early January and definitely not in February. Seeing his enthusiasm and after listening to all his blackmailing phrases, I too agreed and we ended up booking our flights for 9th January. After the tickets, next came the question of finalizing the itinerary. 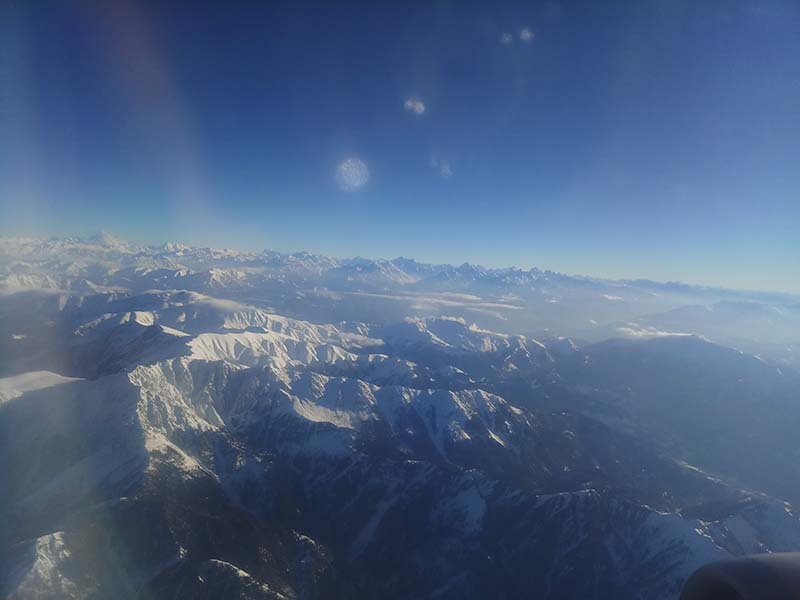 Our flight was at 8 AM on 9th from Delhi and we would land in Srinagar at 9. Return flight was on 13th January at 4 PM. So this gave full three days and half of 2 days. I was inclined towards including Sonamarg in our itinerary but a couple of phone calls revealed that the road was already closed. From Srinagar, we could only travel as far as Gagangir. So once Sonamarg was out, I changed the itinerary to to include Pahalgam and this is how our initial plan panned out. But like always, this was just the initial plan; and as it usually happens with me, our final trip turned out to be entirely different. As the D-Day started to get closer, I got a bit nervous about what to pack. I have been on winter trips before to places that were covered with snow all around; but those were all road trips so I could pack all that I want. But since we were catching a flight this time, I had to limit my packing to just 15 kilograms. 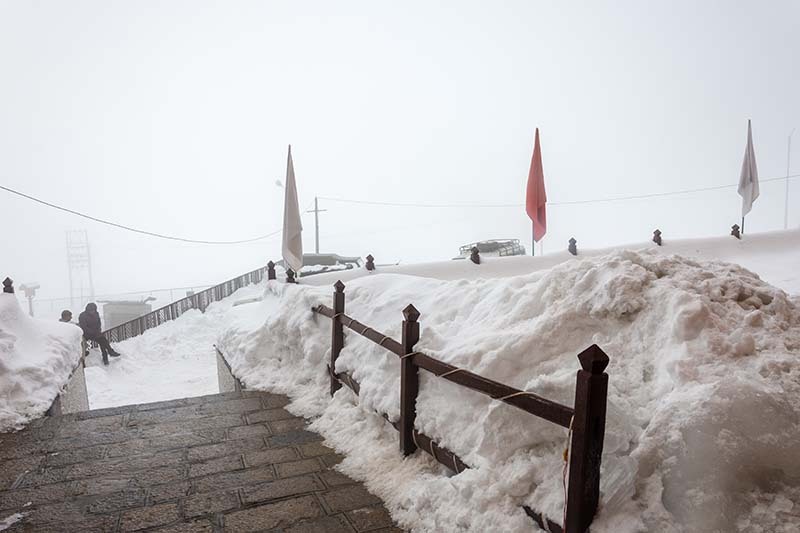 I made a few phone calls to a couple of people I know in Gulmarg and was told that it was already snowing there; and about 3 to 4 feet of snow had already accumulated on the ground. There was also a forecast of heavy snowfall on the days when I was going to be there. My biggest worry was about what shoes to bring. But I was informed that snow boots are available on rent in Gulmarg and I could get a good knee length pair for Rs. 200 per day. So I decided to bring my Provogue boots and then would rent a pair in Gulmarg itself. The only thing that remained were a good pair of gloves and snow caps that I bought online for both me and my cousin. After all the painful waiting and tons of excitement, it was finally 9th of January and time for us be on our way to Gulmarg. Not much to write about this part of the journey really. 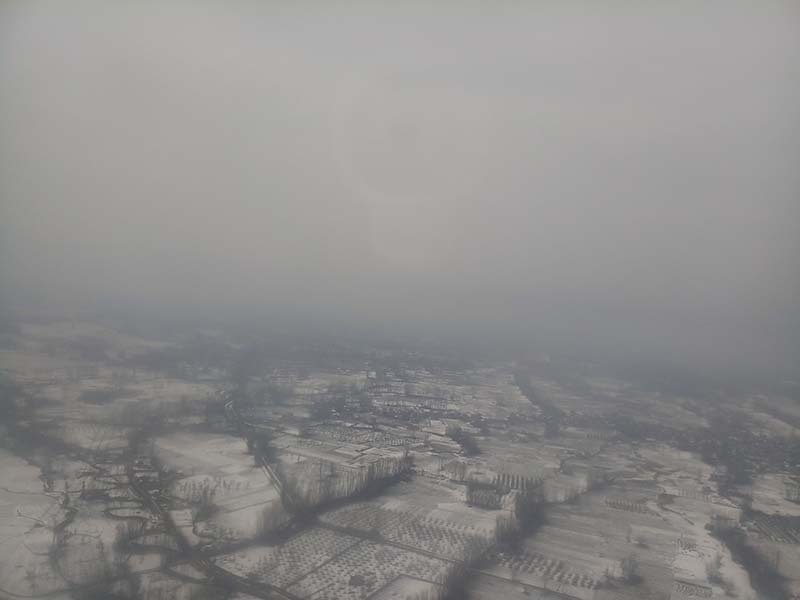 We booked an Uber from my place at 6 AM, reached the airport at 6.30 AM; boarded the flight and took off at 7.50 AM; and landed in Srinagar at about 9 AM. Our driver Gulzar was already waiting for us at the airport; and soon we were cruising on our way to Gulmarg. 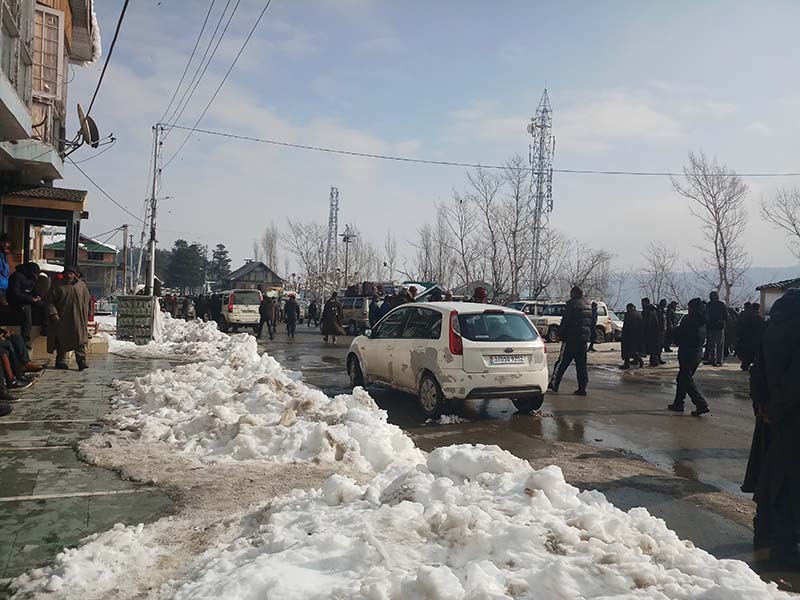 There was snow in Srinagar and Magam but not much; just a few on both sides of the road. But as we kept getting closer to Tangmarg, the amount of snow too slowly kept increasing. After about an hour and a half, we finally reached Tangmarg. Surprised and shocked are the two words that describe my feelings the best upon reaching here. The last time I was at Tangmarg, the entire place was deserted and there were hardly any people around. But now, it was like a “mela” out here. The entire small town was crawling with taxi drivers and guides. And as expected, the nuisance of so called “guides” started the moment we reached Tangmarg. It was tough to walk even a few meters without a guide asking you to rent a taxi, rent snow dress, boots; or simply their services as a guide. This is one thing that I hate about Gulmarg the most. These guides and pony owners are nothing less than a hassle; and will ruin your entire experience of the journey. Gulzar dropped us at Tangmarg and now I was confused about how to get to Gulmarg. The private taxis were asking for Rs. 1000 for a drop to Gulmarg; and there was just no way I was going to pay that kind of money for a drive of 15 kilometers. The next choice was then to find a shared taxi but I wasn’t sure where to get it from. I knew shared cabs were available from Tangmarg and charge Rs. 50 per person; for Gulmarg but I just couldn’t find any shared cabs standing around. All that I could see all around were private taxis and guides trying to sell me stuff. I asked a few people about shared cabs but they just shrugged their shoulders. Finally, it was the owner of a restaurant that came to rescue. We were having a cup of tea and I asked the owner about where we could get a shared cab. The gentleman that he was, he told us to walk back a little and look for a “service gaadi” at the Bus stand. The mystery was thus revealed about why no one knew about shared cabs here because the locals call them as “service gaadi”. We finished our tea, walked back to the Bus stand and voila, there were shared cabs in form of Tata Sumo parked there. Interestingly enough, I also saw a few mini buses and one of them was just about leaving for Gulmarg. I asked my cousin if we should try a Bus instead and he agreed. We both hopped on and found a couple of seats for ourselves. The Bus journey however soon proved to be a mistake. The seats on both sides were way too small for two people to sit together but we had no choice other than to squeeze ourselves in the small space. Managing our bags was a cumbersome and painful task altogether. After about 35 to 40 minutes of slow and inconvenient journey, we finally reached Gulmarg. The only comfort we found in opting to ride the Bus was that it cost us only Rs. 25 per person so we did save some money there. The journey from Tangmarg to Gulmarg was an interesting one. A couple of kilometers after Tangmarg, the road was all covered in snow entirely. Every single vehicle, including the bus we were in, was running on snow chains and even then, we saw plenty of vehicles stuck in the snow en route. I so badly wanted to get some good pictures of the route but we were cramped up in a tiny Bus; and all that I could focus on was to somehow survive the painful journey journey of 15 kilometers that seemed like a lifetime long. We finally reached Gulmarg and the Bus dropped us at the main chowk. The moment we reached there, people started to pitch in their services for money. There was this one guy in the bus who even offered to show us the way till the hotel for a couple of hundred bucks. Once we stepped out of the Bus, we were immediately surrounded by the so called “guides” asking us to hire them. Second in line were the local sellers asking us to rent snow boots and coats. We simply just ignored everyone and continued to walk towards the hotel. 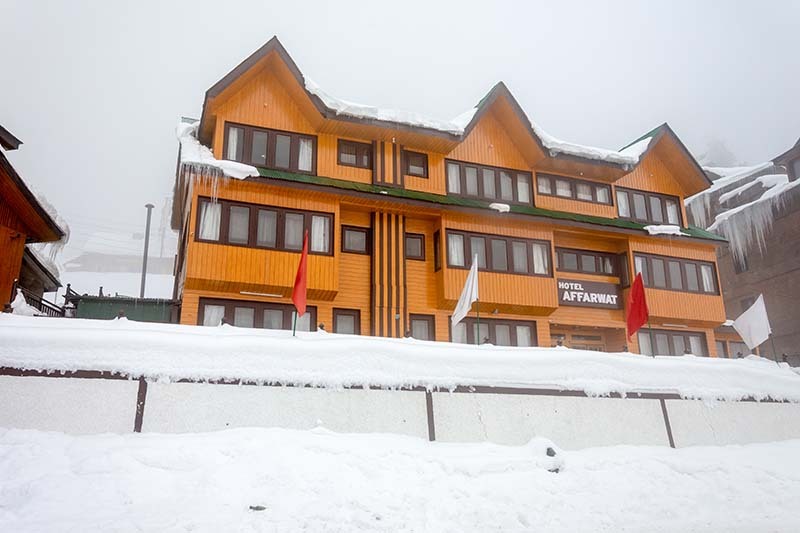 The last time I was in Gulmarg, I stayed at Hotel Affarwat. It is a great and comfortable hotel and even for our winter, I have booked a room here. The manager remember and recognized me immediately; and I was surprised to find that he gave us the same room 301 that we stayed in the last time I was in Gulmarg. The room did have a great view of Gulmarg Golf Course. 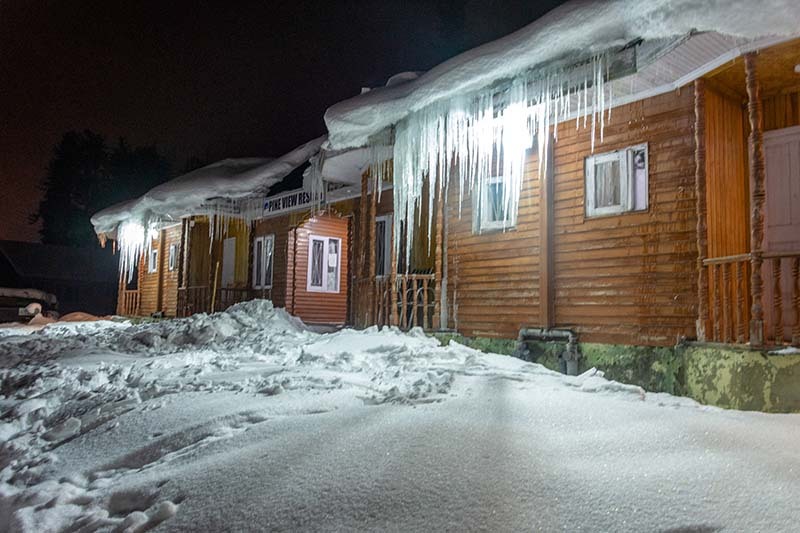 I have posted a detailed review of this hotel with some pictures at Hotel Affarwat – A Great Place to Stay in Gulmarg. Once checked in, I stepped out to meet Sohail. He runs a restaurant in Gulmarg by the name of Malik Hotel. During our last visit, we ate at his restaurant only and made friends with him. Even after we went back to Delhi, he stayed in touch and it was him who had kept me appraised about the weather conditions and all the snow. My cousin was immediately crawled inside the blanket and refused to come out. Outside, it was foggy all around and you could barely see anything. I was actually a bit disappointed with it because with the fog, it was just snow on the ground and fog in the air, nothing else. Walking carefully and slow (to make sure I don’t end up slipping and falling on the snow), I reached the main market, met Sohail and had a cup of much needed tea. I asked Sohail about the fog and he said that it should all clear tomorrow. But for that particular day, it was really a gloomy one. I could not even get a single good picture of the surrounding because nothing was visible really. We pretty much spent our entire day lazying around in the hotel and only stepped out after dark to have dinner at Sohail’s restaurant. To make the matters worse, the TV in our room stopped working so we really had no choice but to call it a day and go to sleep. Thankfully, we were both dead tired and the moment we turned off the lights, sleep came in within minutes. And the scary “snow knives” hanging from the roofs everywhere. And thus ended our first day of the trip from Delhi to Gulmarg. Mentioned below are some details about this part of journey that I believe can be of help for anyone planning a trip. By Road, total distance between Delhi and Gulmarg is about 900 kilometers, depending on where you start from in Delhi and which route you take. For your first leg of the journey, Delhi to Srinagar that is, you can either chose to travel via Jammu Srinagar Highway or via Mughal Road. To know more, please read How to Plan a Journey on Mughal Road. In order to reach Gulmarg from Delhi, your journey will have to be in three phases. First is to reach Srinagar from Delhi; second is to reach Tangmarg from Srinagar; and third is to reach Gulmarg from Tangmarg. If you were traveling from April to November, then you can just drive straight from Srinagar to Gulmarg. 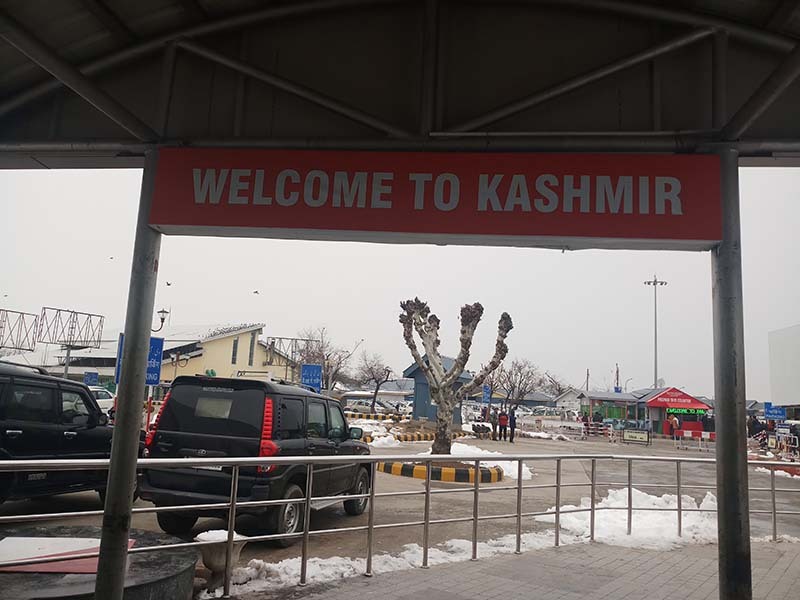 But if you were traveling between December to March, then you will first have to get to Gulmarg and look for an alternate mode of travel there. 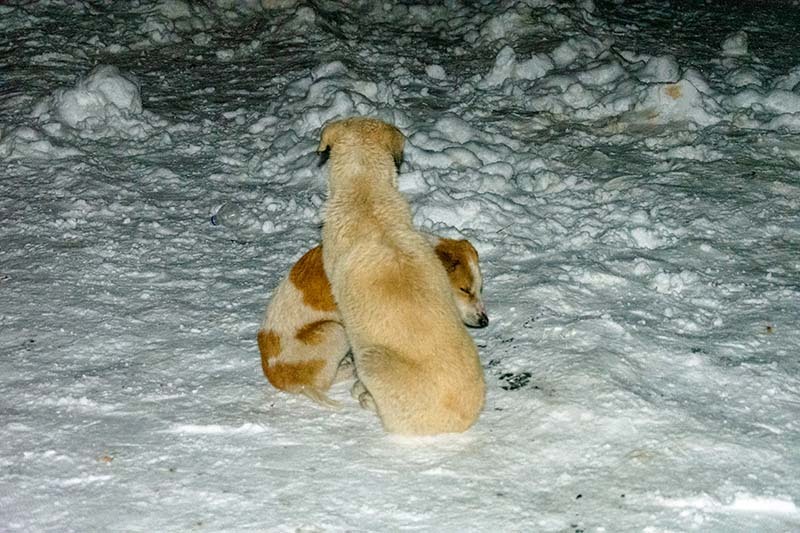 To know more, please read How to Plan a Journey to Gulmarg in Winter? There is no direct Bus between Delhi and Gulmarg. You will first have to reach Srinagar and from there, look for a Bus for either Magam or Tangmarg. From both these destinations, you can find a bus or shared taxi for Gulmarg. 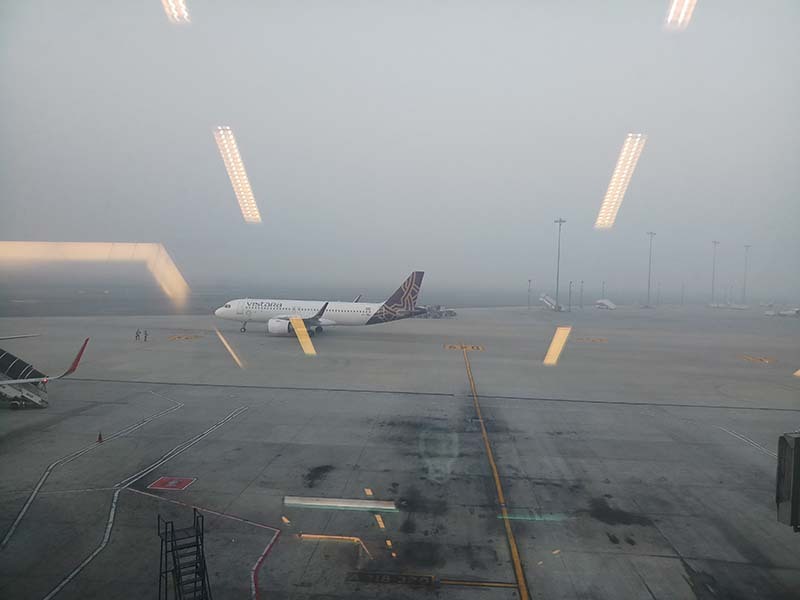 Srinagar Airport is the nearest airport to Gulmarg. It is located about 60 kilometers from Gulmarg and the journey can be completed in 2 to 3 hours. The major airlines operating regular flights to Srinagar are Air India, Jet Airways, Spice Jet, Air Asia, and IndiGo. From Srinagar, you can either rent a private taxi for Gulmarg or board a Bus like I explained above. Srinagar railway station is the nearest railway line to Gulmarg. Problem however is that it is not yet fully operational and connected. At the time of writing this article, it will take at least another 18 months to 2 years for a full connectivity. Right now, you can reach till Udhampur by train. From Udhampur, you will then have to board a bus or taxi for Ramban. After reaching Ramban, you will then board another train from Ramban to Srinagar. An easier way thus would be to just board a bus or shared taxi directly from Udhampur to Srinagar. From Srinagar, you can either rent a private taxi for Gulmarg or board a Bus like I explained above. If you were planning a trip by your own car, then it is indeed a great choice. It will save you a lot of hassle and money really. You can reach Srinagar via Jammu Srinagar Highway and then take Mughal road for getting back to Delhi; or do it vice versa. The only catch however is winter season. The entire 15 kilometers stretch from Tangmarg to Gulmarg remains buried deep under snow and you really need to have some great driving skills to handle it. Snow chains too will be absolutely necessary. 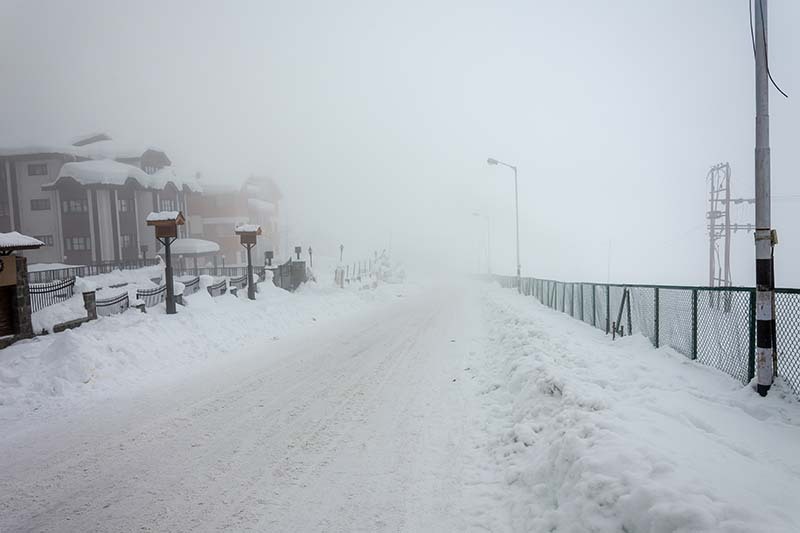 If you do not have much driving experience on snow, I would say that you avoid driving to Gulmarg on your own. And that is pretty much it for our first day of the journey. 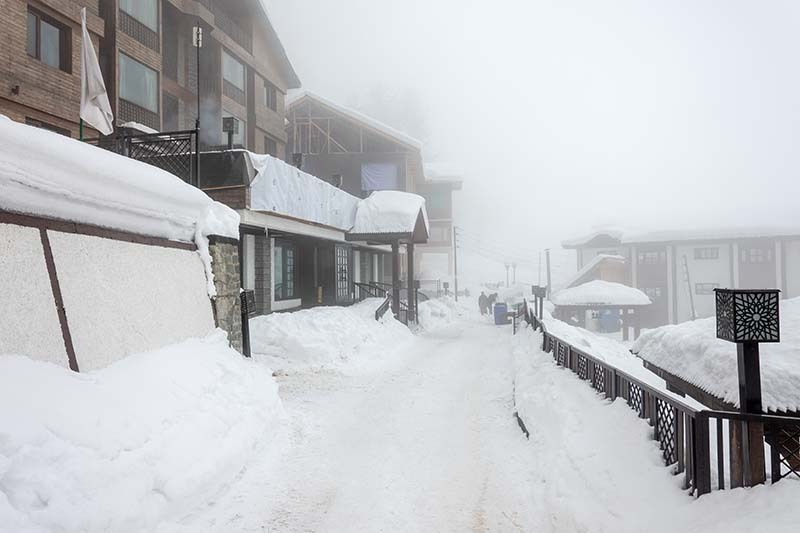 Please read Gulmarg in January – A White Wonder to continue reading the next part of this travelogue. I hope the information and travelogue above was of help. If you have any other questions; or need any further details; please feel free to ask in the comments section below; or at our Community Forum; and I will be glad to answer.